The circuit I hiked noted on Bing imagery. 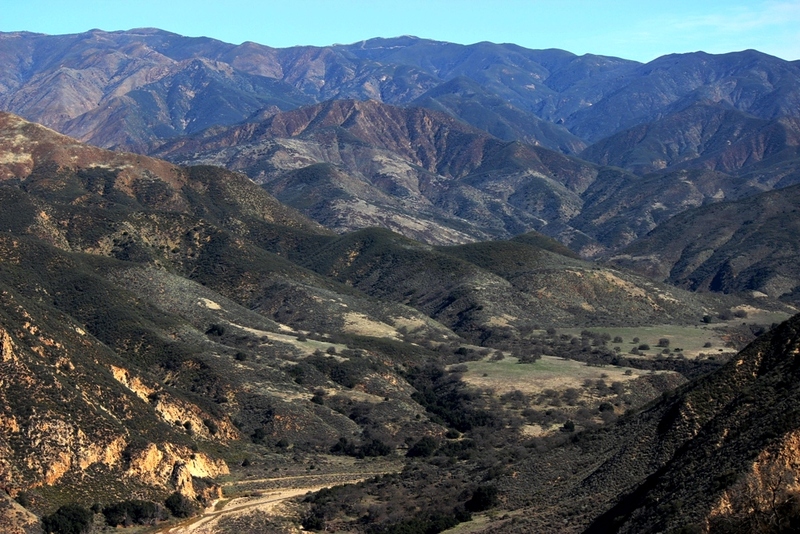 I woke early and hit the super slab driving up over the Santa Ynez Mountains, across the Santa Ynez Valley and over Figueroa Mountain to the lower Manzana Creek trailhead in the San Rafael Wilderness. In preparation for getting my arse kicked out on the trail by this suicyco mutha***** I’m soon to do some hiking with, I spent eight hours, plus an hour lunch break, hiking over 21 miles of trail and no less than 4500 feet in combined elevation gain and loss. Despite the length, the loop is a relatively easy walk as most of the trail is fairly flat apart from the climb up Potrero Canyon to Hurricane Deck and back down to Manzana Creek at its confluence with the Sisquoc River. As the morning waned the sky cleared to pure blue but with cool winter temperatures. I hiked all day in a short sleeved t-shirt under a long sleeved shirt. Not much wildlife this time around. I only saw a few deer, couple of hawks, a small snake and three turkeys. 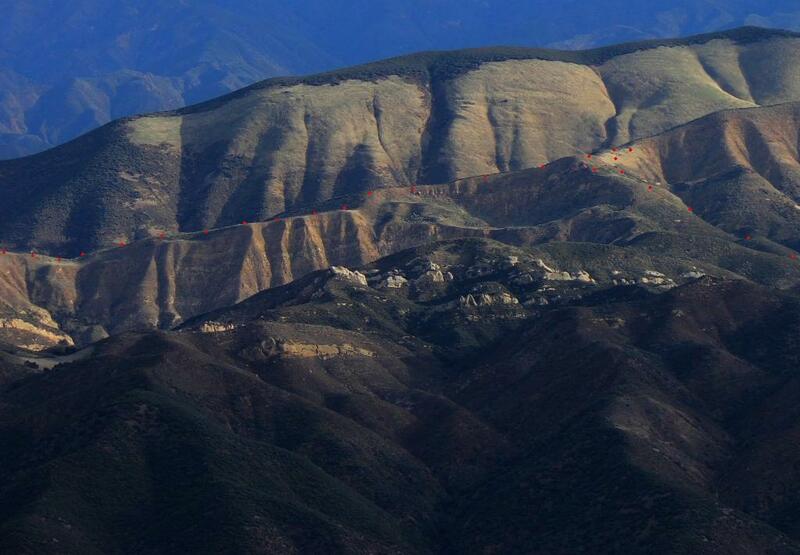 A section of west Hurricane Deck in morning light, the red dots noting the trail route. The more prominent grassy face of Bald Mountain is seen rising just beyond the Deck with the Sisquoc River canyon in the background. A panoramic iPhone camera shot from atop the west end of Hurricane Deck and looking over the Sisquoc River canyon at center frame. 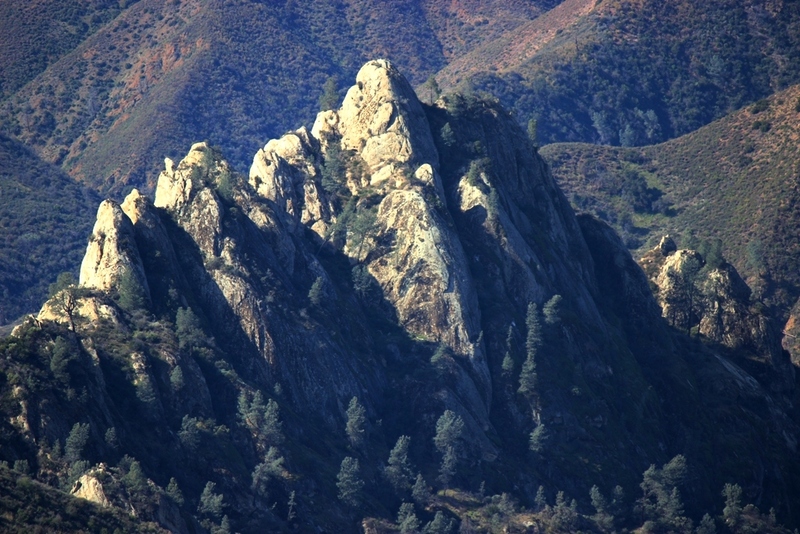 Castle Rock can be seen on the left along the ridgeline. 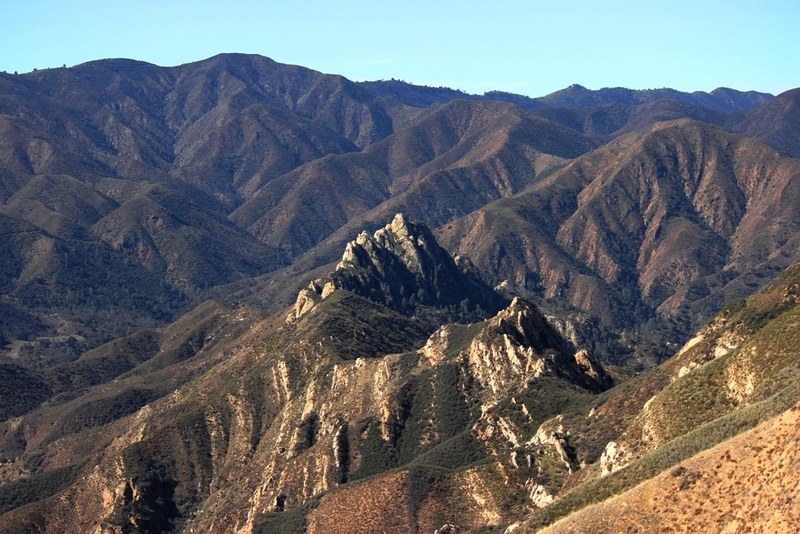 The trail follows the crest of the ridge by Castle Rock and then descends to the Sisquoc River and Manzana Creek confluence. Looking up stream on the Sisquoc River from Hurricane Deck. It’s rugged, unforgiving dry country that is still making a recovery from wildfire. A view of Castle Rock showing the burnt, barren hills of the San Rafael Mountains. 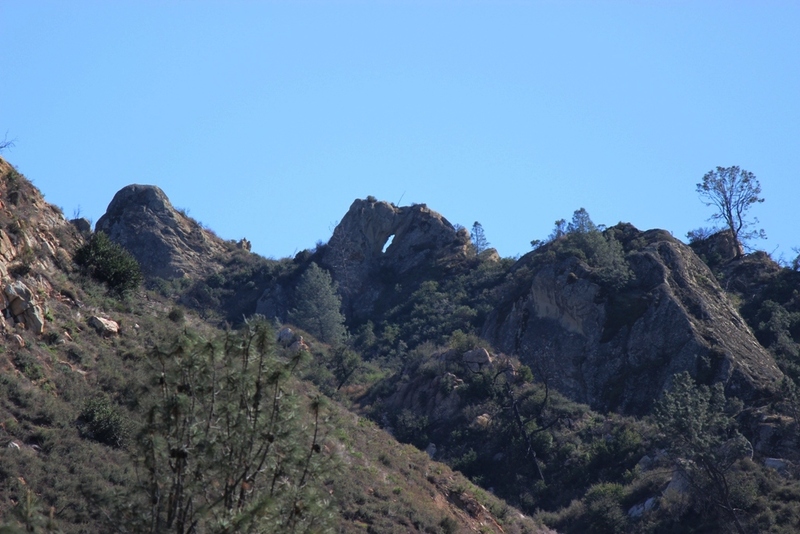 The slit in the rocks above Manzana Creek. 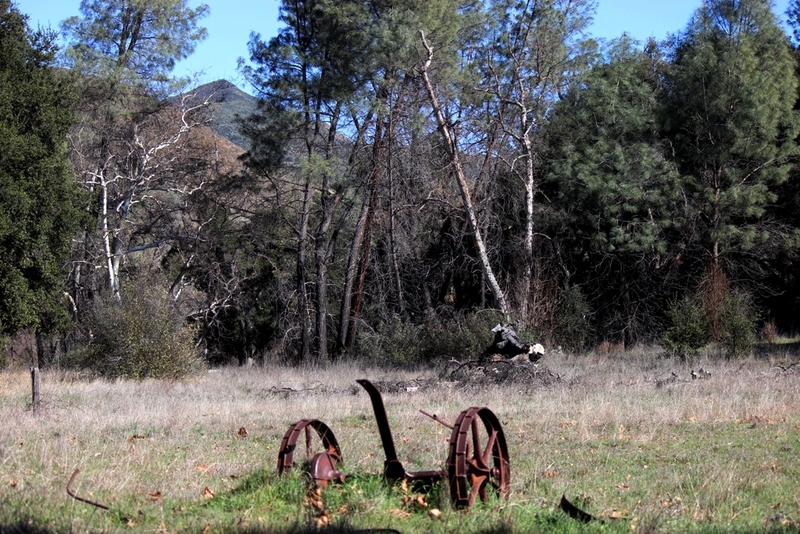 This rusty remnant of a tractor or tiller of some sort sits in a meadow along Manzana Creek. A stacked rock wall is nearby and judging by the lichen covered stones it appears old. Knowing next to nothing about old farm equipment, I would hazard a guess that, judging by the wheel design, this piece of machinery is from the Depression-era. Here below is a series of clips captured along the hike and slapped together. It was shot with an iPhone and so the imagery is poor, pixelated and pretty rough, but, nonetheless, it offers a bit more of a peep into what the day was like through my eyes. 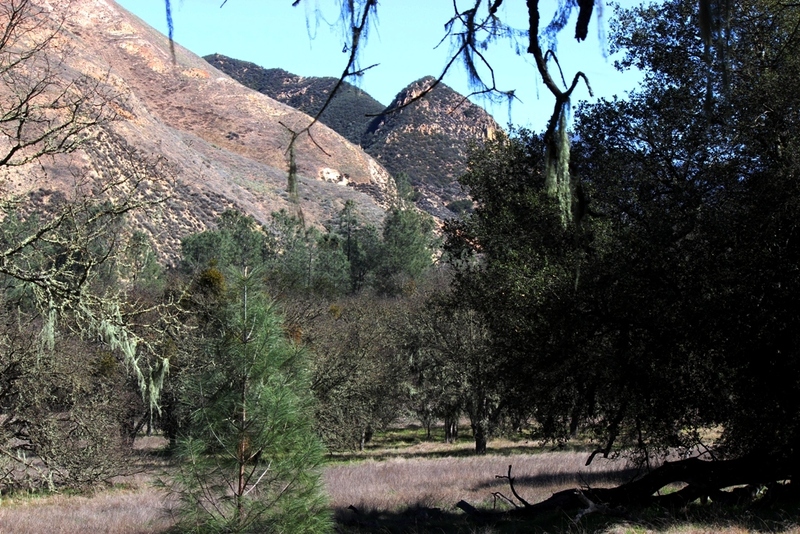 This entry was posted in Santa Barbara County and tagged Hikes, Hiking, Hiking (2), Hurricane Deck, Landscape, Manzana Creek, Nature, San Rafael Wilderness, Sisquoc River, Video, Wilderness. Bookmark the permalink. Great post Jack! I love all the pictures, I’ll reblog it for sure! How’s the water situation in the creek from NIRA to the Schoolhouse? I’m not sure about that, haven’t been out thataway in a while. Great post on a huge day hike in the San Rafael Wilderness. Jack – Great trip and an artistic iPhone rendition. Me likes. How was the water situation in the Sisquoc? Hey Bryan. Thanks, glad you liked it. I didn’t get any closer to the Sisquoc than the closest camp at Manzana just below the schoolhouse, but from what I saw it was just a trickle. It was flowing, but down there in the flats around Manzana it was slow and low. That’s some impressive mileage for one day. Just fantastic! Excellent day. Need to do more stuff behind S.B. Great effort on pulling off the West Deck loop as a day hike. I have yet to try that hike in that manner. Counterclockwise seems like the wise route plan. Yeah, it’s already getting pretty dry and hot back there and the flies are on the rise.